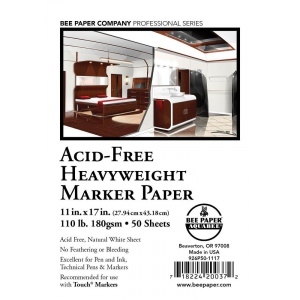 Acid free natural white sheet with excellent erasing qualities. * Crisp ultra smooth sheets are especially designed for detailed work. * Approved for use with Copic and Touch markers and ink Artist Marker Paper has an excellent surface for use with pen and ink crowquill pens technical pens water-based and permanent markers. * No feathering or bleeding. * 110 lb. (180 gsm).